Ever since I wrote about homemade granola bars last fall I have been consistently making them every week. 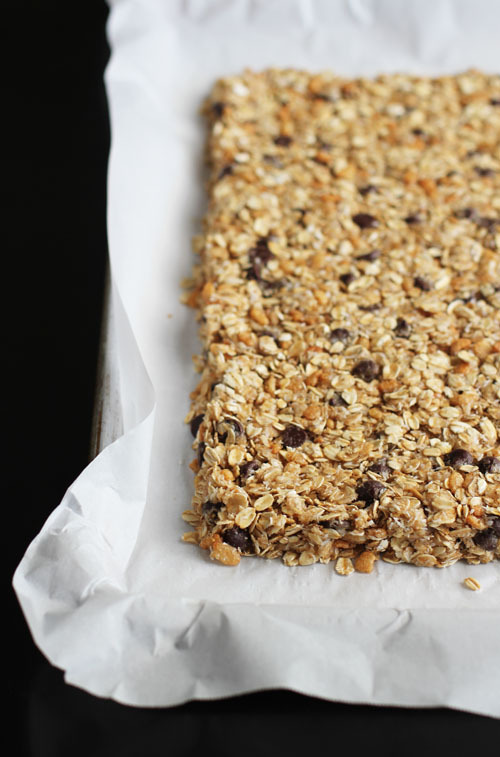 I haven’t bought a box of granola bars since – the homemade version is just too delicious! With all this granola bar making that I’ve been doing, I finally have the recipe memorized and making them is a snap. However, there is one part of the process that is always a little tricky – pushing the granola bar mixture out into a rectangle before baking. The granola mixture sticks to your hands so you have to work very carefully, especially around the edges. Well, I accidentally stumbled upon a trick that solves the problem: push the granola into shape with wet hands! One day I washed my hands and went to make the granola bar rectangle without drying my hands off first – it was the most magical mistake! With just slightly damp hands, the granola mixture does not stick at all to your hands, making it sooooo much easier to form the granola into a nice, squared-off rectangle. That’s all for today. Just a simple little trick to make your granola-making endeavors easier. 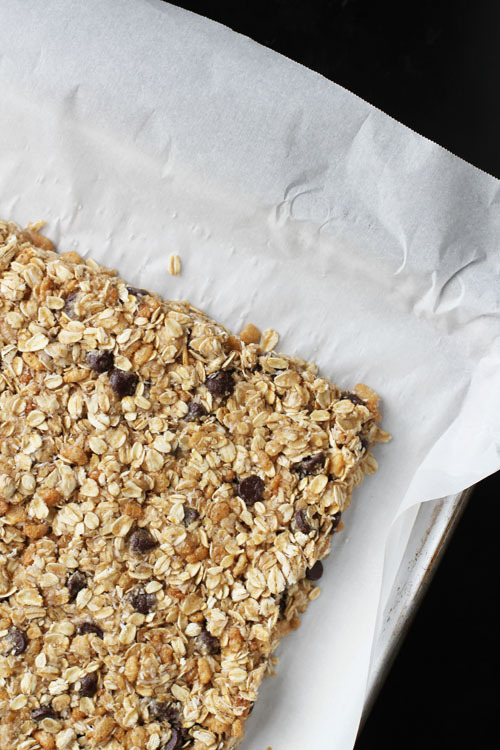 Also, if you haven’t started making homemade granola bars, hop to it already. Super, duper, crazy delicious. I learned that when I was doing rice krispie treats. I was like why didn’t I think of or do this earlier! I am SO going to try this with rice krispie treats – GENIUS! I love this accidental mistake turned into tip! I have yet to make granola bars, I’m so behind the times! I do the same when working with 5 minute whole wheat bread dough. Works much better than flour for that particular dough. (5 minute bread dough is VERY WET already). Great idea. I need to make these! My boys love choc chip granola bars. And these are so tasty, as I learned when someone else made some and I got to sample them! I just happened upon that a couple of weeks ago with rice crispy treats also. Same thing, washed hands and no sticking! I thought the same thing too, why I didnt think of that along time ago!! Ya know, thats how potato chips were invented, accidentally! aha! rice krispie treats, of course! love it! it’s surprising how this tip comes in handy in so many situations – and, you’re right, once you figure it out it’s like, “how did I not know this?! ?” 🙂 I’ll remember that for cookie dough balls – telling my mom now!